Both couldn’t contain their emotions as they exchanged their personal vows moments before their wedding last March 2. 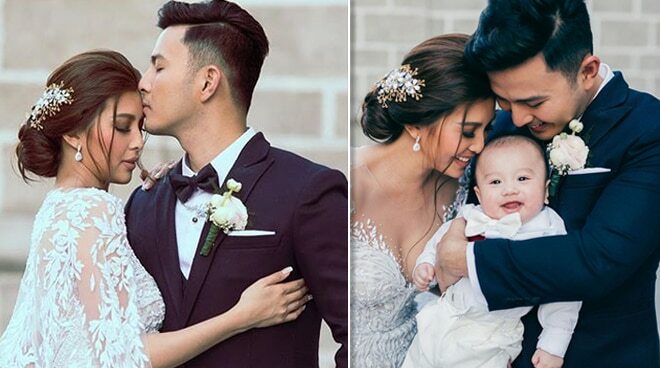 Celebrity couple Sunshine Garcia and Alex Castro were all tears as they exchanged their personal wedding vows moments before their nuptials at the Manila Cathedral last March 2. In their official wedding video courtesy of Nice Print Photography, both couldn’t contain their joy and excitement on entering this new phase of their lives together, something that they have dreamed about since becoming official three years ago. Meanwhile, the former Sexbomb dancer promised to stay faithful to her husband and father of her child, six-month-old Axel, no matter the odds. “Mahal na mahal kita, at mamahalin kita kahit dumating na ‘yung araw na hindi ka na kamahal mahal. Lagi lang akong nasa tabi mo at nakasuporta sa ‘yo, kami ng mga anak mo. Hindi mo lang ako basta magiging asawa, sa oras na panghinaan ng loob, ako ang magpapalakas sa ‘yo. Hindi man tayo mabuhay o magkasama forever, isa lang ang alam ko. Mula sa oras na pagmulat ng mga mata ko, hanggang sa oras na isasara ko na ito, ikaw na ‘yung huling lalaking mamahalin ko bukod sa mga bata,” she said. The couple, dubbed SLex, happily announced their engagement via social media in December 2017. They welcomed their first child together shortly a few months prior to tying the knot. Alex has another son from a previous marriage.